[S417] John George Weidner, State of Illinois; Department of Public Health - Division of Vital Statistics; Standard Certificate of Death, country of birth only. [S535] 05 Jul 1860 1860 U. S. Census, Arlington Heights, Cook County, Illinois, USA, Wheeling Township, page 151, dwelling 1061, family 1022, 1860 census states he is 30 years old and born in Bavaria, written as "Bayinn." [S870] Mary Dittrich, State of Illinois; Department of Public Health - Division of Vital Statistics; Standard Certificate of Death, Birth country only. [S875] John B. Weidner, State of Illinois; Department of Public Health - Division of Vital Statistics; Standard Certificate of Death, Birth country only. [S1068] Agnes B. Nickol, State of Illinois; Department of Public Health - Division of Vital Statistics; Certificate of Death, Birth place given as Stadeldorf, Germany. [S1069] Paul J. Weidner, State of Illinois; Department of Public Health - Division of Vital Statistics; Certificate of Death, Birth country only. [S25] Enterprise Register, 19 Sep 1903, p. 4, col. 5, date only. [S8] Edwin Weidner, The Weidner History, 8 death year only. 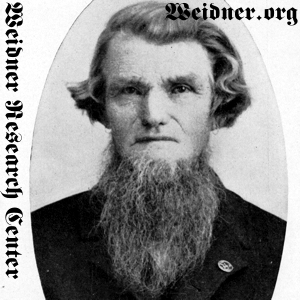 [S11] John J. Weidner, Compiled Birth, Death, 597 date only. [S189] Cook County Herald, 06 Nov 1914, p. 8, col. 3, date only. [S189] Cook County Herald, 06 Nov 1914, p. 8, col. 3. [S575] George Weidner, State of Minnesota; Division of Vital Statistics; Certificate of Death. [S896] Unknown author, Church Records, 1853-1915, St. Mary Catholic Church, Buffalo Grove, Illinois, Film Number 1548218, Items 22-25, St. Mary, Buffalo Grove, Baptism 1855-1901, N.I., page 8. [S11] John J. Weidner, Compiled Birth, Death, 630. [S417] John George Weidner, State of Illinois; Department of Public Health - Division of Vital Statistics; Standard Certificate of Death. [S46] Arlington Heights Herald, 29 Jan 1932, p. 5, col. 5. [S103] Arlington Heights Herald, 27 Apr 1945, sect. 1, p. 2, col. 5. [S104] Arlington Heights Herald, 28 Dec 1945, sect. 1, p. 3, col. 4. [S870] Mary Dittrich, State of Illinois; Department of Public Health - Division of Vital Statistics; Standard Certificate of Death. [S11] John J. Weidner, Compiled Birth, Death, 556. [S1068] Agnes B. Nickol, State of Illinois; Department of Public Health - Division of Vital Statistics; Certificate of Death. [S11] John J. Weidner, Compiled Birth, Death, 642. [S1069] Paul J. Weidner, State of Illinois; Department of Public Health - Division of Vital Statistics; Certificate of Death.